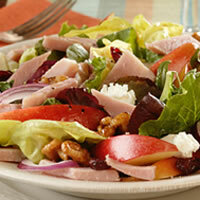 In this salad, smoky ham and sweet apples are highlighted by goat cheese and walnuts. Spoon salad mixture onto individual salad plates. Top with ham; sprinkle with goat cheese. Serve immediately.